Four BIG events to bring the community together this weekend. 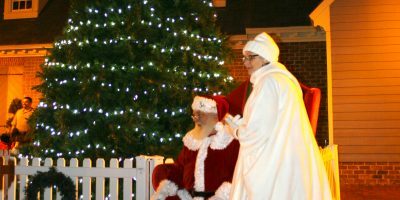 Join the celebration in Yorktown for the annual Christmas Tree Lighting, Christmas Market on Historic Main Street, Lighted Boat Parade, and Cookies with Santa. The weekend begins the evening of Friday, November 30, with the annual Christmas Tree Lighting Ceremony at 7:30pm. Everyone is invited to gather at the Yorktown Victory Monument by 6:30 p.m. Highlights include a performance by the Fifes and Drums of York Town at the Victory Monument, festive music at Riverwalk Landing, the procession of lights through the historic village, and the arrival of Santa and Mrs. Claus. This free event is sponsored by the York County Historical Committee. The excitement continues Saturday, December 1, with the 13th Annual Christmas Market on Main Street. From 10 a.m. to 3 p.m., visitors can enjoy musical entertainment, roasted chestnuts, more than 50 arts & crafts vendors, food, and a visit from Santa and Mrs. Claus. The Town Crier rings in the market at 10 a.m., followed by a performance from the Fifes & Drums of York Town to officially open the market. Main Street entertainment begins at 10:30 a.m. with strolling instrumental ensembles, caroling, and holiday arrangements, concluding at 1:45 p.m. Whether you’re searching for a holiday gift for family, friends, or as a treat to yourself–you’re sure to find it at the Christmas Market on Main Street! This is one of the most anticipated Yorktown events every year. Other historic buildings and museums to visit include: Custom House, American Revolution Museum at Yorktown, Yorktown Battlefield, Watermen’s Museum, York County Historical Museum, and Museum on Main. Just a short walk (or Trolley ride from Main Street), you’ll find Black Dog Gallery, Redcoat Antiques, and all Riverwalk Landing businesses waiting to welcome you in the spirit of the season. It simply doesn’t get more “Christmas” than this! Main Street in Yorktown. Waterfront events begin at 6 p.m. with complimentary hot cider. The Fifes & Drums of York Town perform in the glow of a beach bonfire as the crowd awaits the magnificent parade of lights. Judging of the dazzling displays begins at 7 p.m. As an added safety precaution, families are encouraged to bring flashlights to help you get around town at night. Guests attending the Lighted Boat Parade are encouraged to park at the York-Poquoson Courthouse and the County Administration Building, both on Ballard Street. From there it’s a short walk to the waterfront. A modified Trolley route will run from 5 p.m. to 9 p.m. making stops at those locations as well as the Victory Monument, and the intersection of Water and Read Street. Additional parking (for this evening only), will be available at the American Revolution Museum at Yorktown from 5 to 9 p.m. Free transportation will be provided from the Museum to the festivities. This free event is sponsored by the Yorktown Lighted Boat Parade Committee and Wormley Creek Marina. On Sunday, December 2, the Gallery at York Hall features Cookies with Santa. From 1 to 4 p.m., children and parents can visit with Santa, enjoy complimentary refreshments, and do some holiday shopping! The Gallery showcases fine arts in all mediums, and features select local artists on a revolving basis. For more information on specific exhibits, call the Gallery at York Hall at (757) 890-4490. This free event is sponsored by the Celebrate Yorktown Committee. Public parking for all special events is available at the Riverwalk Landing parking terrace on Water Street, York Hall (with the exception of Friday night), County Administration Building, and the York-Poquoson Courthouse. The heated, handicap-accessible Yorktown Trolley runs Saturday only, from 10 a.m. to 4 p.m.for the Market on Main Street event and then again that night, from 5 to 9 p.m. with a modified route for the Lighted Boat Parade. No rain dates are scheduled for the holiday weekend events. Check next weekend events in Yorktown!